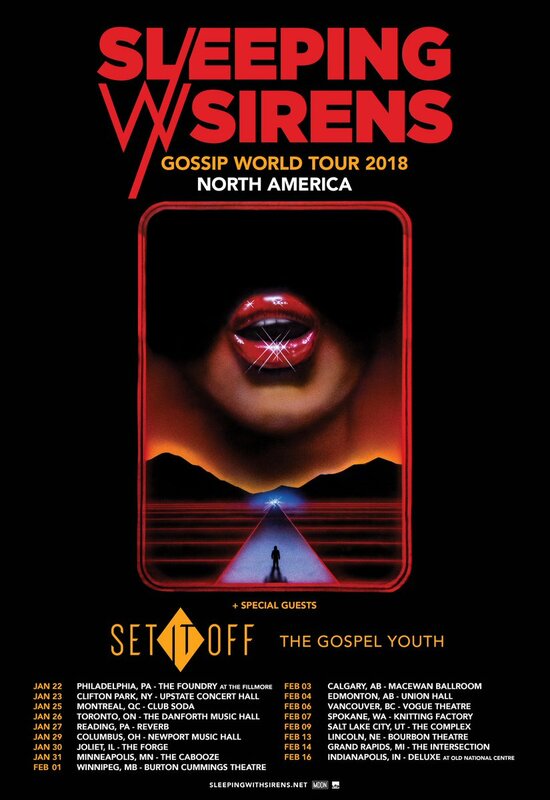 Sleeping With Sirens have announced that they’ll be celebrating the release of Gossip with new North American tour dates to kick 2018 off right. The tour starts January 22 in Philadelphia, and the 18-date run will wrap up February 16 in Indianapolis. Plus, Set It Off and the Gospel Youth have been announced as support, meaning it’s going to be a serious party. Tickets go on sale Friday at 10 a.m. local time. Check out the full list of cities and dates below! Sleeping With Sirens’ fifth album, Gossip, just came out in September. Vocalist Kellin Quinn spoke to AP about the record’s themes of finding hope among trying times: “I think [it’s about] being lost and then finding hope,” Quinn says. And though they’re likely not going to be bringing their holiday tunes with them on tour in January, you can listen to their festive holiday song “Christmas On The Road” here.